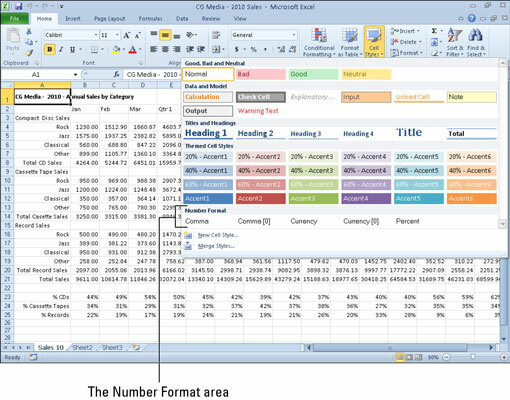 Excel 2010 includes the Live Preview feature, which enables you to see how a new font, font size, table style, cell style, or number format would look on your selected data before you actually apply it. This feature saves tons of time that would otherwise be wasted applying format after format until you finally select the right one. All you have to do to use Live Preview is mouse over the thumbnails in the drop-down menu or gallery to see how each of its styles will look on your actual data. When you see the formatting that fits your data to a tee, just click its thumbnail to immediately apply it to the selected cell range. For example, when working with a table in Excel 2010, the Design contextual tab enables you to use the Live Preview feature to see how your table data would appear in other table styles. You can select non-adjacent cells (by holding down the Ctrl button) or a contiguous cell range. On the Home tab, in the Styles group, click the Cell Styles button. Use Live Preview to sample cell styles or other formatting options before you make your selection. A drop-down gallery gives you a wide range of choices and colors, including number formats. Position the mouse pointer over any of the styles in the Cell Styles gallery. The cell formatting changes to reflect each style as you point to it. Click the desired cell style from the gallery. The Cell Styles gallery closes and Excel applies the style to the selected cells. If Live Preview doesn’t seem to be working, the feature may have been disabled. Click the File tab and then click Options. Click the General tab and then select the Enable Live Preview check box under User Interface options. Click OK.